Ghetto Gladiator Bobi Wine is one of the music giants we have in East Africa. He has been activelly singing from 1999. Ragga, Dancehall and Afrobeat are the music genres he sings his songs in. He is the fonder and president of the famous Fire Base Crew based in Kamwokya -Kampala. Chano8 caught up with him in an exclusive question and answer interview and this what he had say. Chano8: Its 2016, tell us how your 2015 was? 2015 was a successful year, off course it had its own challenges but I always focused on the success. We managed to hold concerts which were successful and our music reached more to our fans. Chano8: 2016 is here, what do you have in stock this year like music and videos? We released our very first music video this year called Dembe and it’s advocating for peace. Chano8: Your fans await for your Ndi Muna Uganda Song’s video, when is it coming out? Am shooting it this week, so we should be able to release it in about two or three weeks from now. Chano8: You have worked with Nubian Lee for a long time, what is the secret keeping you guys together? I guess we have allot in common, first of all we are all artistes, we are all Pan Africanists, peace lovers and may be the success of the projects that we do keeps asking us to do more projects. Chano8: What unique thing should Ugandans, especially your fans expect from Bobi Wine in 2016? Am gonna be a more peaceful artiste, I want to advocate more for peace and patriotism. Chano8: What advice do you give to upcoming artistes? Upcoming artistes, be focused. Know it’s not a very easy road but just don’t give up, listen to your inner self and keep motivating yourself. Chano8: Apart from Nubian Lee, which artistes have you done collabos with recently? I have worked with a couple of artistes but am also uplifting new talent so this year am going to introduce Daxx Vybz. I did a couple of songs with him and I hope it will kick start his career. Chano8: Which artistes in Uganda and other countries do wish do collabos with and why? Am not looking at any artistes but off course, I live every day the way it comes. Any artiste who proves to be positive lyrically, we shall work together. Chano8: Update us on what Fire Base does apart from being a music camp. Fire Base is a collection of various talents, I want to let the world know that Fire Base is not only about musical artistes. It has fine artistes, business people, it has activists. It is a collection of young people trying to change the world by them selves. Chano8: Any concerts this year? Yeah! We are having a big concert on Valentine’s Day at One Love Beach. That’s the first concert of this year. Chano8: What achievements have you gotten out of the music industry? Being able to communicate, collecting such a huge fan base, being followed is a big success to me. Chano8: What challenges do you face as an artiste? I get miss understood so many times just because of the Geographical location where I come from and may be from my out look. Chano8: How do you overcome them? Confidence. I always do everything with confidence and people sort themselves. Chano8: Nigerian Music is a big competitor of Ugandan music, what do you think can be done for our music to totally out compete Nigerian music? We don’t want to erase it totally, but I think we should give priority to our own. Radio stations, night club djs and Ugandans at large need to be taught how to love themselves. They need to learn how to embrace our own, cherish our own and in that way, we shall move steps. We did that but we seem to be losing it but I hope the enthusiasm comes up again. Chano8: Apart from your music, which artistes’ music do you listen to? All musicians, I listen to Madoxx Ssematimba, Eddy Yawe and also many artistes. Chano8: What do you do apart from singing? I am a farmer, am a social activist, am a business man and a florist. Chano8: We are told this year you want to make drastic changes in your life. Does this mean you will do away with your differences with Bebe Cool? I did away with my differences with Bebe Cool five years ago, only that we don’t communicate, we don’t meet face to face to talk. My theme this year is not friends not enemies. 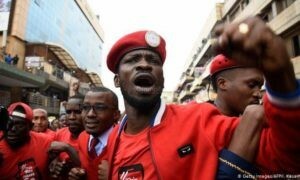 Chano8: Anything we didn’t know about Bobi Wine? May be you dint know that Bobi Wine loves his country much more than you thought, Uganda is much more dear to me than anything. Chano8: Your last remarks for your fans. They are the reason why I keep going. So many times I feel like giving up but then there is this new energy they give me that keeps me going. Let them come to One Love Beach on Valentine’s Day and let’s share the love.